Organic Farm Vang Vieng – Preserving ecological diversity and providing people with accessible & sustainable ways to earn a living. 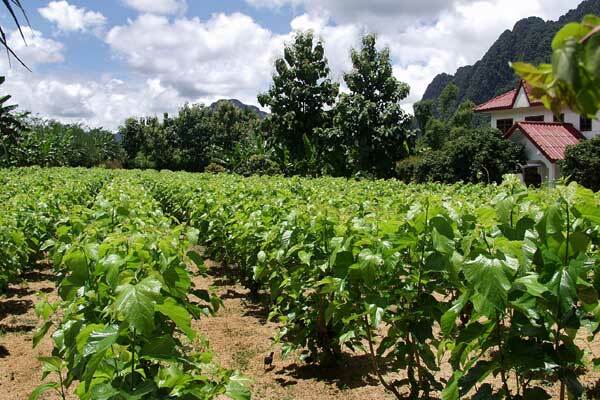 Organic Farm Vang Vieng promotes the use of natural materials & traditional methods for growing its crops & raising its animals, without using chemicals or artificial fertilizers, which are harmful to both our health & the environment. Our high quality natural food is enjoyed by visitors of our Farm’s organic food restaurant & various other restaurants in Laos. Leading by example, we aim to show people around the world that organic farming methods can be profitable as well as healthy. We truly hope you can have a rewarding experience at Organic Farm Vang Vieng!